Deadshot (Floyd Lawton) is a fictional character appearing in American comic books published by DC Comics. Created by David Vern Reed, Lew Schwartz, and Bob Kane, the character made his first appearance in Batman #59 (June–July 1950). He is an excellent sniper who regularly boasts of never missing a shot, and is often considered as one of the deadliest assassins in the DC Universe. Deadshot is an adversary of the superhero Batman and belongs to the collective of enemies that make up his rogues gallery. Though normally portrayed as a supervillain, he is sometimes depicted as an antihero. IGN's ranked Deadshot as the 43rd Greatest Comic Book Villain of All Time in 2009. The character has appeared in various forms of media, like the television series Arrow played by Michael Rowe. He was most notably in the live-action 2016 film Suicide Squad, in which he is portrayed by actor Will Smith. Deadshot in his first appearance from Batman #59 (June 1950). Art by Lew Schwartz, Bob Kane, and Charles Paris. Deadshot is often a hired assassin, regularly boasting to "Never Miss". He is capable of using a large variety of weapons, but is most frequently portrayed as using a pair of suppressed, wrist-mounted guns. He initially appears in Gotham City as a new crime fighter, but is revealed to be an enemy of Batman when he attempts to replace the Dark Knight. He is sent to jail when Batman and Commissioner Gordon publicly expose his plot to become the king of Gotham's underworld. After serving his term, Deadshot begins hiring his services out as an assassin, changing his costume from the top hat and tails he previously wore to a red jumpsuit and distinctive metal face plate with a targeting device on the right side. Deadshot's past is revealed in subsequent appearances. His real name is Floyd Lawton and he grew up in a wealthy household with his mother, abusive father, and brother Eddie. Eddie was beloved by his parents and the other townspeople, while Floyd was a troubled child and was despised by his parents, but Floyd idolized his brother and always stood up for him during conflicts with the town's other children. Floyd's parents were the most powerful people in his town, however, they were known to despise each other. Eventually Floyd's mother claimed his father had become "too abusive", prompting Floyd to kill him. When Floyd took the shot from his tree house, he missed and killed his brother, Eddie, instead. From that moment on, Floyd swore to never miss another shot again. Deadshot has been a major figure in the Suicide Squad in its latest two incarnations, where his skills as a marksman and his disregard for human life serve to advance the group's objectives. Deadshot as he appears without his mask in Suicide Squad vol. 5, #20 (August 2017). Art by Stjepan Šejić. One of his most defining traits is a desire to die in a spectacular fashion, this being his primary motivation for joining the Suicide Squad. He feels he has no reason to continue living, and, while he does not want to commit suicide, he simply does not care if he dies. Various reasons have been cited for this, but the most common thread in them is his parents' peculiar hatred for one another. Deadshot almost gets his wish to die when he confronts a Senator who is threatening to expose the Suicide Squad to the world. Having been ordered to stop his immediate superior, Rick Flag, from assassinating the senator, he kills the senator himself, citing his orders as "Stop Flag from killing the Senator. Exact words". After this Deadshot is gunned down by the police on the steps of the Lincoln Memorial. He survives his wounds, to continue on with the Squad. Lawton's uniform is stolen by an airport employee, who uses it to commit crimes and murders. Lawton is forced to kill the man with a bullet to the head. The shooting of his own "image" affects him greatly; for a while, he does not even fix the hole in his own uniform. While the suit has been lost, Lawton has threatened to kill the man he thought had been responsible, his teammate Captain Boomerang. During a mission for the Suicide Squad, Count Vertigo asks Deadshot if he would kill him if asked. Deadshot agrees and the two go off to a secluded area for the decision. Vertigo declines, a decision Deadshot accepts with no argument. After being affected by the supernatural entity Neron during the Underworld Unleashed storyline, Deadshot decides to kill a kindergarten class via a large explosion. An incarnation of the Justice League stops him. Around this time, Deadshot travels overseas to kill the Pope. Wonder Woman stops him at the last minute. After dozens of villains are infected by the Joker venom, Deadshot, Merlyn and Deadline attack the Iron Heights metahuman prison. Deadline is killed and Deadshot rescues Captain Boomerang from medical confinement. Deadshot had a son named Edward "Eddie" Lawton who appeared in the first volume of the Deadshot series. The character was later sodomized and killed by Wes Anselm. In a second mini-series released in 2005, Deadshot discovers he has a daughter, Zoe, who is being raised in a crime-filled area of Star City. Lawton decides to do right by his daughter, and embarks on a lethal war on the local gangs that plague the area. The series ends with Deadshot faking his death, having realized a normal life is not for him, but also having mostly cleared up the area and convincing Green Arrow to patrol it more regularly. During the 2005–2006 "Infinite Crisis" storyline, Deadshot is featured in the series Villains United. The Secret Six are banded together by a mysterious, shrouded character named Mockingbird (who is actually Lex Luthor) who offers a major reward for committing to the team and a severe punishment for not accepting membership. Deadshot is offered the reward of ruling North America; his punishment is to be the destruction of the neighborhood in which his daughter and his daughter's mother live. At the end of the miniseries, the conflict ends in stalemate and Deadshot's status remains roughly unchanged from the end of his second miniseries. He remains a part of The Secret Six and is shown having reached a grudging friendship with another member, Catman. His share of the payment for the Six' mercenary work is stated to be sent in its entirety to his daughter and her mother. After the Six disband, Knockout comments in passing that he has returned to the Suicide Squad. Deadshot and the Suicide Squad are featured in Countdown, rounding up supervillains for removal. The group encounters Pied Piper and Trickster several times, and each time fail to capture them. In Countdown To Final Crisis #24 Deadshot makes a solo effort to capture them, but the pair again elude him. In issue 22, Deadshot (breaking orders from Amanda Waller and Suicide Squad protocol) attacks Piper and Trickster on a train outside of the Rocky Mountains. Given that the supervillains are aware of Project Salvation (Salvation Run), Deadshot apparently kills The Trickster, leaving Pied Piper on his own. In Salvation Run #2, Deadshot is tricked and sent off to the prison planet along with the last batch of criminals. Rick Flag, Jr. tells him as the Boom tube closes that he cannot have people like him on Earth. Deadshot vows that if he ever returns to Earth, he would take his revenge on Flag. After helping fight off the Parademon invasion, he escapes with the surviving villains in the teleportation machine. In Batman: Cacophony, Deadshot is seen breaking into Arkham Asylum. He goes to the Joker's cell and explains that he has taken a contract on the Joker's life, due to his indirect responsibility for the death of a high school student. Just as he is about to kill the Joker, however, Onomatopoeia arrives and engages Deadshot in a shootout. Eventually, Onomatopoeia gains the upper hand and shoots Deadshot in the head. It is later revealed that Deadshot's armor saves him, and masks his vital signs to make it appear that he had been killed. He explains what happened at Arkham to Batman, before being turned over to the Gotham Police. Batman uses the technology of Lawton's mask to later survive an encounter with the Joker and Onomatopoeia. Deadshot, along with Scandal Savage, Bane, Rag Doll, and Cat-Man reunite the Secret Six, having been hired to retrieve Tarantula from Alcatraz Island, and find a card which she stole from Junior, a mysterious villain who supposedly runs the entire West Coast mob. Junior has practically the entire villain community at her beck and call, all afraid of her, even those in Arkham Asylum. The Six later learn that the card in question was made by Neron, and says "Get Out Of Hell Free." Soon, the Six are attacked by a small army of super-villains, all wanting to recover the card and collect the reward of $20 million for each of the Six, under the orders of Junior, who captures and tortures Bane, whose strong principles and moral convictions, paired with his fatherly fondness of Scandal keep him from betraying his new team. It is later revealed that Junior is in fact Rag Doll's sister and daughter of the first Rag Doll. She has the ghastly appearance of an old clown, with sliced skin and eyes stitched wide open to give the appearance of a clown. The Six escape, and head for Gotham City, with Deadshot seemingly betraying them and leaving with Tarantula. The Six manage to catch up to Deadshot, only to be attacked by Junior and the Super villains, and the Mad Hatter, who is revealed to be the one who hired them, simply so they would be killed. Tarantula sacrifices herself by pulling herself and Junior in front of the Super villains' combined attack, seemingly destroying the card along with them. However, it is later shown that Scandal is now in possession of the card. The Suicide Squad re-enter Deadshot's life when the title returned in January 2010 as a tie-in to the "Blackest Night" storyline. While on a mission to Gotham City to kill several of Batman's allies, Rag Doll insinuates that Deadshot and Cat-Man are friends despite their protestations, something they grudgingly acknowledge. Before this plot thread can be pursued further, the Six are ambushed by an army of superheroes who had come to assist Batman. Deadshot and the rest of the team choose to fight the heroes despite the overwhelming odds, and Deadshot manages to take down Doctor Light before being blasted and rendered unconscious by Green Lantern. The rest of the Six are similarly trounced and defeated soon after. In The New 52 (a 2011 reboot of the DC Comics universe), Deadshot is recruited to the Suicide Squad prior to the events of the first issue. He still has a daughter and wears a costume similar to the one he wore in the 2000s mini-series, but his son has been erased from continuity. In addition, Deadshot no longer has his trademark mustache (though he briefly regrows it to cover a scar in issue #13). He is portrayed as a Batman villain and a rival of Mad Dog, a bounty hunter. He also is bitter enemies with Captain Boomerang. Deadshot is arrested for a failed assassination of a U.S. Senator by Batman and was sentenced to life in prison. Later, he is recruited to be part of the Suicide Squad in exchange for early release. 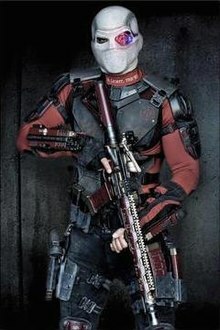 Deadshot is made team leader due to his skill under pressure, but quickly grows disillusioned with the group after a planned visit with his daughter, his first since his arrest, is withheld from him and ultimately aborted within minutes of him reuniting with his daughter in order to send him on a mission. Deadshot ultimately sacrifices his life to kill the evil cult member Regulas, who had brainwashed most of the members of Suicide Squad and had recruited Black Spider into his group Basilisk in order to assassinate Amanda Waller. Deadshot is later revealed to have been resurrected, possibly through use of an arm from Resurrection Man, obtained by the Squad for Waller during an earlier mission. During the 2013–2014 "Forever Evil" story line, Amanda Waller contacts Deadshot to help her get the Suicide Squad back together after the three Justice League teams are "dead." After his money was wired, Deadshot heads out to get Harley Quinn back on the team. During the War of Jokes and Riddles, a story taking place in the early days of Batman's career, Deadshot sided with the Joker. Deadshot engaged Deathstroke, who sided with the Riddler, in a battle that took over 5 days, killing multiple victims. Eventually Batman put a stop to it and gave both a swift defeat. Deadshot suffered severe head trauma and was hospitalized. Deadshot has no superhuman powers, but is the top marksman in the DC Universe, possessing superhuman-like abilities, and regularly boasting to "never miss" his target. The character once shot an apple off of Captain Boomerang's head with his eyes closed. He also intentionally grazed the skull of Enchantress while she was flying, since he was asked to take her down non-lethally. Deadshot has access to a vast array of weaponry, most notably his sniper rifle, and twin machine guns mounted on each arm. Deadshot is allegedly bilingual, and learned to speak Russian as a youth. He also claims to have been a Card-carrying Communist. Deadshot has proven to be a formidable hand-to-hand combatant when needed due to his excellent physical condition and training as an assassin, being able to go in a fist fight against Batman for a prolonged time in one occasion. He's also an expert in different styles of knife fighting and a tactical genius. Deadshot is portrayed as a consummate professional; as long as he has been paid to kill someone, he will always carry it out, without exceptions. Batman was unable to get him to stop threatening a witness by threatening Deadshot or his family; Deadshot rightly assumed that Batman was bluffing. However, Batman ultimately does get Deadshot to abort the hit by freezing his client's bank accounts. Unable to get paid, Deadshot publicly cancelled the assassination, letting the witness go free. Perhaps his most defining trait is his acknowledged death wish, which often manifests as him deliberately engineering situations likely to kill him. This makes him unpredictable as an opponent, as his willingness to die allows him to deliberately injure himself to achieve a goal. For example, during Identity Crisis, he deliberately shoots himself in the neck while fighting Kyle Rayner, so that Rayner would attempt to save him and drop his guard, allowing Lawton to take aim and almost shoot him. He often expresses disappointment at surviving his missions, such as immediately lamenting "damn" when awakening in a hospital. In his run on Suicide Squad, John Ostrander delved into Deadshot's past and family background. The revelation of Deadshot having a brother, whom he idolized, seemed to resonate with Deadshot's attachment to Rick Flag, team leader. Ostrander implied that this relationship also colored Deadshot's rivalry with Batman, whom Deadshot had always been unable—or subconsciously unwilling—to kill. In the Amalgam Comics universe, Deadshot was combined with the Marvel villain Bullseye to create the assassin Deadeye. William Lawton appears as an enemy of Dare the Terminator and Catsai. In the tie-in comic to Arrow, issue "Back from the Deadshot" (set after the events of "Lone Gunmen"), when Floyd regains consciousness, an elderly homeless man approaches him. Deadshot wrenches the arrow from his eye and stabs the old man with it. As he staggers out of the building, he is kidnapped by a group of men in a van after losing consciousness again, before he could be taken by the police. In a hospital room, Lawton wakes up and finds his eye having been operated on. Before his brain could be examined, under the instructions of an unknown man, he breaks out of his restraints and walks out. Two months later, Deadshot appears in Bludhaven and approaches a man who apparently has a job for him, but he is rejected due to having only one fully working eye. He stays in this city as retired assassin before China White gives him a new offer and new eye scope. Deadshot appears in Arrow digital comic, working as part of the Suicide Squad, killing members of the extremist sect Onslaught in the Republic of Kasnia along with Bronze Tiger. The two were later training in the A.R.G.U.S. headquarters, taking out ten men in 7 seconds. Soon afterwards, he, Tiger, Diggle, and Ravan Nassar are deployed to Kahndaq to take down Onslaught. When they arrive at an Onslaught camp, Deadshot takes up his trademark sniper position, killing an Onslaught member as he was about to execute hostages, providing a distraction for Bronze Tiger and Diggle to begin killing other members. After Nassar blows up an Onslaught truck, Deadshot and the rest of the group find a survivor to take them to Khem-Adam. Lawton and Turner torture the survivor, but Diggle manages to convince the survivor to tell the Squad the location of Khem-Adam's lair. They arrive there and free the kidnapped girls, killing several Onslaught agents along the way. Lawton picks up Turner's body after Khem-Adam killed him and carries him out to the waiting A.R.G.U.S. helicopter, insisting that he be buried in his home country. Deadshot appears as the main antagonist of the tie-in digital comic taking place between the video games Batman: The Telltale Series and Batman: The Enemy Within. Hailing from a family of wealthy real-estate tycoons, Floyd witnessed his older brother killed by his abusive parents when he was a child and later murdered them when he was fourteen while setting it up to make it look like they killed themselves. Inheriting his family's wealth, he quits the real-estate business and becomes a military contractor, giving him access to a large arsenal of weapons. Lawton later discovers that despite his parents being sent to Arkham Asylum on accounts of child abuse before his brother's death, they were not committed to the prison as their doctor, Thomas Wayne, agreed to keep them out of the asylum as long as they give him a large discount on a building that would eventually become Wayne Tower. After the revelations of Thomas Wayne's corrupt nature were brought to the public in the first game, Lawton becomes Deadshot and uses his expert marksmanship to hunt down the Arkham staff that were working at the asylum during the time period that Thomas operated. In The Flash digital comic, Lawton teams up with Digger Harkness and Carrie Cutter as part of the Squad. They watch The Flash take on the meta-human King Shark. Waller tells him and the rest of the Squad to suit up, as they were going in to stop the Shark. They arrive outside of the man's former apartment and Deadshot helps to knock him down, before Cupid traps him with a net. Joe West approaches, asking who they were, before Lawton introduced them as the Suicide Squad. They each fire at him, but he is saved by The Flash, who rushed him to safety while the Squad appears to recognize him. Set in a near alternate future of the New 52, Lawton is imprisoned in an underground Belle Reeve missing his shooting arm. He, and the future Black Manta and Harley Quinn are broken out by Amanda Waller, who informs them that they were imprisoned and forgotten as the government found a way to clone super villains and Suicide Squad members in Texas. After Harley and Manta are killed by Joker clones, Deadshot allows Waller time by taking on a Deathstroke clone in a sword fight. Despite his disadvantages, Deadshot defeats the clone and sacrifices his life in the process. Deadshot's actions allowed Waller to break into the main hub and stop the cloning. Deadshot makes a cameo in the Tiny Titans series as a player on Lobo's soccer team called the Secret Six. While Deadshot wasn't in the TV series Young Justice, he did appear in the tie-in comic. He is seemingly hired by Queen Bee to assassinate Quraci President Rumaan Harjavti, but is intercepted by Superman, Superboy, and Miss Martian. He does manage to shoot Ruuman's brother, Sumaan in the shoulder before he's nearly beaten to death by Superboy (who was aggressive due to Luthor's patch drug) and carried to the hospital by Superman. Queen Bee revealed that Deadshot did succeed as his mission was to actually injure Suuman (as Suuman would be viewed as a hero to the public and she has Suuman under her control). Zoe Lawton was created by Christos N Gage and Steven Cummings. She made her first appearance in Deadshot #1. The daughter of Michelle Torres and Deadshot, Zoe was conceived following a casual liaison. Her mother gave up prostitution and drugs for Zoe's sake and moved them to a poor neighbourhood in Star City, where she was raised for four years without her father's knowledge. Zoe and her mother are approached by Deadshot who has recently learned of her existence. She is babysat by Deadshot, with whom she bonds. Later, when Deadshot is forced to leave the family for their protection, she is granted admittance to a good school thanks to her father's connections. Spending time with her father and mother in a park, Zoe is present when they are suddenly attacked by Lady Vic and Double Dare. She and her mother are allowed to flee by the assassins, but return to assist Deadshot. She is the reason Deadshot does not kill any of his assailants. Later, she is present when her father calls her mother and informs her that he will never see them again, for their own safety. Zoe is an ordinary human child and has no known superhuman powers or abilities. Zoe makes a non-voiced cameo appearance at the end of Batman: Assault on Arkham present on the rooftop as her father has Amanda Waller in targeting sights. Zoe appears in flashbacks of Arrow, portrayed by Audrey Wise Alvarez. This version appears to be Deadshot's legitimate daughter with Susan Lawton. She is seen flashbacks in the episode "Suicidal Tendencies". Zoe appears as a minor supporting character in Suicide Squad, portrayed by Shailyn Pierre-Dixon. Zoe makes a cameo appearance during Suicide Squad: Hell to Pay living in Lacoma, Utah. She does not speak in her appearance. Zoe appears in Injustice 2 in Deadshot's ending. She is also mentioned in several of Deadshot's fight dialogues. Deadshot was briefly considered to be featured in The New Batman Adventures, with Michael Rosenbaum considered for the role via mannerisms of Kevin Spacey. Floyd Lawton / Deadshot appears in Justice League and Justice League Unlimited, officially voiced by Michael Rosenbaum. In "The Enemy Below" (Part 1), he is hired by Ocean Master to kill Aquaman. However, Deadshot's assassination attempt is thwarted, and he is captured by the Justice League and interrogated by Batman. In "Hereafter", Deadshot later appeared with several other supervillains celebrating Superman's supposed death, where they wreak havoc on Metropolis. He specifically targets Batman, however, the Man of Steel stops Deadshot's bullet and then knocked out by the Dark Knight. In "Task Force X", Lawton's execution is cancelled when Colonel Rick Flag recruits him into a government unit of supervillains that go on missions in exchange for a reduced sentence. When the team travel to the Watchtower to steal the magical Annihilator automaton, Floyd provides cover for his teammates, coming into conflict with many superheroes in the process. Deadshot appears in Batman: The Brave and the Bold, voiced by Tom Kenny. In the episode "Night of the Batmen", Deadshot goes on a crime spree with various other villains in Gotham City during Batman's absence, only to be defeated by Green Arrow impersonating Batman. Deadshot appears in Justice League Action, voiced by Christian Slater. This version is shown wielding futuristic laser guns instead of his usual firearms. In the episode "Double-Cross", the Penguin tasks Deadshot with killing Two-Face who has already been apprehended by Batman. Deadshot confronts Batman and Plastic Man, the latter of whom was disguised as Two-Face to prevent Deadshot from fulfilling his task, in a Gotham warehouse. When Plastic Man accidentally blows his own cover, Deadshot flees the two superheroes in pursuit of the actual Two-Face who had escaped capture earlier. Deadshot and Two-Face are later defeated and apprehended by Batman, Plastic Man and Firestorm. In this case, Deadshot was defeated when Plastic Man shapeshifted into one of Deadshot's guns. Deadshot appears in the tenth and final season of Smallville, played by Bradley Stryker. He is featured in the episodes "Shield" and "Collateral". Floyd Lawton / Deadshot appears on The CW's television series Arrow, portrayed by Michael Rowe. He is a former soldier who became estranged from his wife and daughter due to suffering from post-traumatic stress disorder. He makes his debut in "Lone Gunmen", hired by businessman to eliminate competition, but he is partially blinded by the Arrow after their last fight. In "Dead to Rights", Deadshot is given a cybernetic eyepiece by China White to restore his vision and hired to kill Malcolm Merlyn who apparently succeeds, but Malcolm survives thanks to Tommy Merlyn's blood transfusion when poisoned. In "Home Invasion", it is revealed that he returned in Star City for potential contract but is actually a trap set by A.R.G.U.S. to capture him. Lawton realises this trap and kills some agents, including to try to kill Lyla Michaels, but John saves her life. John and Lawton fight each other, but Floyd punches John to the ground and he escapes from the building. In "Keep Your Enemies Closer", Floyd was found to have been captured in Russia and taken to Koshmar prison. A.R.G.U.S. sends John to release him, but also release Lyla who was sent to release him but is captured as well. Lawton helps Diggle to release his wife. All three escape from prison and get in a van with Oliver Queen, Felicity Smoak and Anatoly Knyazev. Due to his sense of honor, John allows him to walk free. Before leaving, Floyd tells him that he was hired by H.I.V.E. to kill Andy Diggle, rather than Andy's client, as he intended for the situation to appear. In "Suicide Squad", he is seen as a member of the titular group. He and other members go to mission in Markovia to retrieve a deadly nerve gas in the possession of the terrorist. Deadshot later realises the trick from ARGUS that he is intended to be killed along with a nerve agent to be destroyed. He is saved by Lyla when cutting a chip with Ben Turner's claws in order to disable a drone heading to its location. In "Unthinkable", the Squad and Deadshot assist John Diggle and Lyla in stopping Waller from destroying Starling City during the terror of Slade Wilson and his Mirakuru army. In "Suicidal Tendencies", Lawton is sent in a mission in Kasnia to rescue hostages and U.S. senator Joseph Cray from terrorists, but is revealed to be a ruse by Cray. He is presumably killed during a mission when he is caught in a building explosion. He appears as a hallucination in "A Matter of Trust", where John Diggle mentions that his body was never recovered after the explosion. Michael Rowe reprises his role as Floyd Lawton's Earth-2 counterpart on The Flash. In the episode "Welcome to Earth-2", this version is shown to work for the CCPD as Iris West Allen's partner, and given the nickname "Deadshot" for his poor use of firearms rather than being an expert like his Earth-1 counterpart. Deadshot appears in Batman: Gotham Knight, voiced by Jim Meskimen. In his self-titled segment "Deadshot", he first appears on a ferris wheel, where he uses a long range sniper rifle to assassinate a local mayor, before leaving behind a cartridge case with the initials "D.S.". After being contracted to assassinate Batman by the Russian Mafia, Deadshot uses an assassination attempt on Commissioner James Gordon as bait. However, Deadshot is ultimately defeated and apprehended by Batman. Much like the early comic book version, this incarnation dresses in an elegant fashion. Deadshot makes a non-speaking appearance in Superman/Batman: Public Enemies. He is among the villains hired to kill Superman and Batman. Deadshot appears in Batman: Assault on Arkham (which is set in the Batman: Arkham video game universe), voiced by Neal McDonough. He appears as the leader of Amanda Waller's Suicide Squad, and is frequently flirted with by fellow member Harley Quinn, whom he has a one-night stand with. In the film, the group is sent to Arkham Asylum to retrieve the Riddler's cane, which contains information that Waller seeks. After encountering both Batman and the Joker, Riddler assists Deadshot in destroying the explosive chip Waller had implanted in his head as leverage. No longer a member of the Suicide Squad, Deadshot is last seen targeting Waller from a building's roof, with his daughter in the background. Deadshot appears in Suicide Squad: Hell to Pay, voiced again by Christian Slater. While he is again the leader of Amanda Waller's Suicide Squad, he again plans to be a free man and reunite with his daughter Zoe, who previously dissociated from him (as shown in the beginning of the film on which she rejected most of his mail letters) due to his past crimes. But by the film's epilogue, they end up seemingly reconciled after they meet again. It is assumed that by the film's end, Deadshot is a free man. Will Smith as Floyd Lawton / Deadshot in a publicity still for Suicide Squad (2016). Will Smith portrays Floyd Lawton/Deadshot in the DC Extended Universe. Smith has signed a multi-picture deal for the franchise. This version is African-American as opposed to Caucasian in the comics. The character makes his debut in the 2016 film Suicide Squad, directed by David Ayer. Described as the "most wanted hitman in the world", Lawton is apprehended by Batman whilst out shopping with his daughter, Zoe, in Gotham City. He is subsequently blackmailed into joining Amanda Waller's government task force composed of captured supervillains. After the "Suicide Squad" put an end to the crisis in Midway City by defeating the Enchantress, Lawton is allowed supervised visits with his daughter in addition to having ten years removed from his sentence. He is last seen reading Zoe's letters and exercising in his cell at Belle Reve Prison. Deadshot will not appear in the upcoming sequel The Suicide Squad due to scheduling conflicts with Smith. It was initially reported that Idris Elba would replace him in the role; however in April 2019, it was confirmed that Elba will instead play another character. Deadshot makes a cameo in Ready Player One. Deadshot appears in the Nintendo 3DS and PlayStation Vita versions of Lego Batman 2: DC Super Heroes as an unlockable character. He can be found in the level "Brawl at City Hall". Deadshot appears as a playable character in Lego Batman 3: Beyond Gotham, voiced by Robin Atkin Downes. Deadshot appears in Lego DC Super-Villains, with Matthew Mercer reprising his role from Injustice 2. Deadshot is featured in Injustice: Gods Among Us. He appears in the background of Stryker's Island. His Suicide Squad film iteration is playable in the game's mobile version. Deadshot appears as a playable character in Injustice 2, voiced by Matthew Mercer. In the game story, he is forced to become a member of The Society after Gorilla Grodd comes into possession of the detonator to the explosive implanted inside Deadshot's head, and battles the Flash and Catwoman or Cyborg during Brainiac's invasion. In his single player ending, he hands Brainiac and Grodd into the authorities. As a reward, not only is his sentence at Belle Reeve annulled, but Bruce Wayne funds a surgery to get the nanoexplosives out of his head, allowing him a second chance at being a father to Zoe. Deadshot appears in the Batman: Arkham series, voiced by Chris Cox. In Batman: Arkham City, Deadshot is hired by Professor Hugo Strange to assassinate political prisoners with sensitive information regarding Arkham City. Batman manages to track Deadshot down and prevent him from killing Jack Ryder before apprehending him. In the prequel Batman: Arkham Origins, Deadshot appears as one of the eight assassins hired by the Joker (disguised as Black Mask) to kill Batman. He forces the vigilante to confront him in the Gotham Merchants Bank, where he and his men are ultimately subdued by Batman. Deadshot also appears in Batman: Arkham Origins Blackgate. Deadshot's weapons appear in the GCPD's evidence room in Batman: Arkham Knight. Deadshot appears in stages 1 and 2 of the Batman Nintendo Entertainment System video game. Deadshot appears as a playable character in the mobile game Suicide Squad: Special Ops based on the film. Bullseye, a similar assassin from Marvel Comics. ^ White, James (October 28, 2015). "From Slipknot To Captain Boomering (And Back Again): Meet The Suicide Squad". Empire. Archived from the original on October 30, 2015. [Deadshot] was originally created by Bob Kane, David Vern Reed and Lew Sayre Schwartz in 1950 as a prime villain for Batman. ^ "Cupid, Deadshot & Diggle Debate Value of Love in New "Arrow" Clip". Comic Book Resources. ^ "Deadshot is Number 43". ign.com. Retrieved 2015-07-14. ^ "Suicide Squad: First Look At Will Smith In Full Deadshot Costume". Comic Book.com. ^ Danzis, Alan (May 14, 2014). "'Arrow' Exclusive: Michael Rowe on Deadshot Becoming a Hero, Diggle and Life Changing Tattoos". BuddyTV. Retrieved June 11, 2015. ^ Flash (vol.2) #179 (December 2001). DC Comics. ^ Deadshot (vol. 1) #2 and 3 (December 1988). DC Comics. ^ Deadshott (vol. 1) #1 (February 2005). DC Comics. ^ Richard George (2009-10-15). "Blackest Night's Future: January 2010 – Comics Feature at IGN". Comics.ign.com. Retrieved 2010-12-29. ^ Secret Six (vol. 3) #36 (August 2011). DC Comics. ^ Suicide Squad #1. DC Comics. ^ Suicide Squad #3. DC Comics. ^ Suicide Squad #5. DC Comics. ^ Suicide Squad #14. DC Comics. ^ Justice League of America (Vol. 3) #7.1. DC Comics. ^ Detective Comics (Vol. 2) #23.2. DC Comics. ^ "Deadshot". DC. 2014-03-06. Retrieved 2019-04-12. ^ Eric Goldman (2010-08-03). "Smallville Casts Hawkgirl and Deadshot". IGN. Retrieved 2010-12-29. ^ Chavez, Kellvin (December 10, 2015). "LR Hot Rumor: Will Smith Might Just Join Ben Affleck's 'The Batman' Movie". Latino Review. ^ Kit, Borys (December 13, 2016). "David Ayer, Margot Robbie Reteam for All-Female DC Villains Movie 'Gotham City Sirens' (Exclusive)". The Hollywood Reporter. ^ "'Suicide Squad' Cast Revealed: Jared Leto to Play the Joker, Will Smith is Deadshot". Variety. Retrieved 6 December 2014. ^ Kroll, Justin (February 27, 2019). "Will Smith Exits 'Suicide Squad' Sequel (Exclusive)". Variety. Archived from the original on February 27, 2019. Retrieved February 27, 2019. ^ Kroll, Justin (March 6, 2019). "Idris Elba Replaces Will Smith as Deadshot in 'Suicide Squad' Sequel". Variety. Retrieved March 6, 2019. ^ Kit, Borys (March 6, 2019). "Idris Elba in Talks to Replace Will Smith in Suicide Squad Sequel (Exclusive)". The Hollywood Reporter. Retrieved March 6, 2019. ^ Goldberg, Matt (2019-04-05). "'The Suicide Squad': Idris Elba to Play New Character Instead of Deadshot". Collider. Retrieved 2019-04-06. ^ "LEGO Batman on Twitter". Twitter. Retrieved 19 November 2014. ^ Copeland, Wesley. "Gamescom 2016: Harley Quinn And Deadshot Join Injustice 2 Roster". IGN. Retrieved 17 August 2016. ^ @matthewmercer (February 22, 2017). "Just got the go ahead that I can proudly announce I am voicing Deadshot in the upcoming #injustice2 video game! 'Tis an honor to be a part" (Tweet). Retrieved February 23, 2017 – via Twitter. ^ BatmanArkhamCity (August 30, 2013). Blackgate Handheld Trailer "Under New Management". YouTube. Retrieved August 30, 2013.